When you encountered this kind of error this could be a keyboard or corrupt boot.ini problem. To solve this kind of issue I'm giving you some tips on how to solve it. 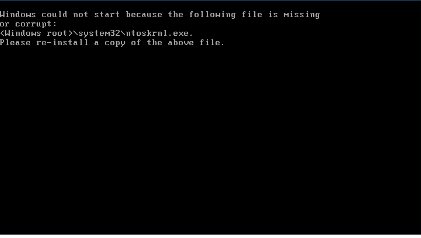 I encountered this error on my Windows XP desktop, this may also occur or other previous OS like NT, 98 etc. I also experience this kind of error but I'm too lucky that it is only a keyboard problem. My case was I have a keyboard with scanner (KB wedge) attached on it that caused the keyboard to malfunction. Windows prompted me on that error and resolve by just replacing the old keyboard with a new one. 1. The issue commonly caused by a short in the ground wire in the keyboard cable. You can troubleshoot the issue by replacing your keyboard with a good one. If the good one works then the your old keyboard is the problem. 2. The issue also arises when your keyboard is not directly to connected to PC keyboard port. Like for example you are using a Barcode scanner or other devices that conflict your keyboard. You may try removing all the connected device and try to connect the keyboard to check the issue. 3. For Windows XP users, f the boot.ini is severely corrupted or missing, by running Microsoft Windows XP can fix the boot.ini missing issue. Reboot your computer, press "F10" or "F12" in order to select boot options. Select boot on CD option. After you select you will see this message press any key to continue. After pressing any key you'll be prompted to an option, press the R key for recovery console. Then select which operating system to want to fix, provide your administrator credentials. Next message will appear asking you to overwrite the file, just type Y and press Enter to overwrite the file. Type exit to restart the computer. For more detailed information and support about the error please read Microsoft article http://support.microsoft.com/kb/314477. Hope it helps!